We love the sweet sentiment on this chart! 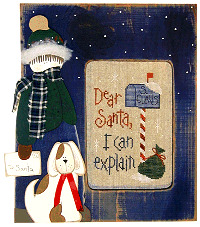 The design features Santa's personal North Pole mailbox with an overflow mailbag nestled in the snow. The frame is a real treasure with a charming boy and his faithful spotted dog. We think Mrs. Claus will want to stitch this one!